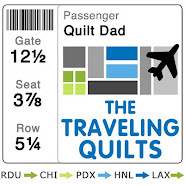 Quilt Dad: Giveaway Day TODAY! 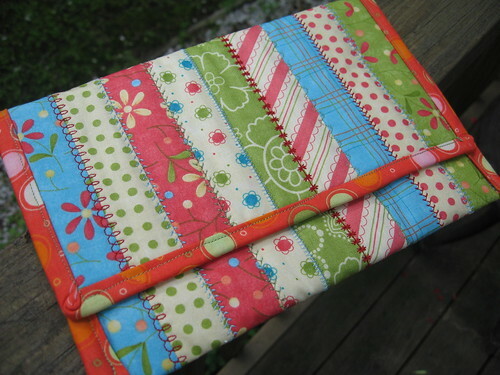 In celebration of Sew Mama Sew's May Giveaway Day, I am happy to give away this homemade bookkeeper / Kindle holder. For those of you who are Kindle-less (like me), I will include a Moleskine that tucks neatly inside for you to record your thoughts, ideas, and inspirations. I will also include some extra goodies, like some fabrics and sewing notions. I haven't pulled them together yet for a picture, but I promise they will be good! Just leave a comment to this post, and I will leave entries open until midnight EST on Sunday, May 31st. No need to say anything other than "hello", unless you have some great ideas for projects you'd like to see on the Moda Bake Shop. I will select my winner via Random Number Generator sometime on June 1st. International entries are always welcome!! What a great giveaway! I love Moda Bake Shop too! no Kindle yet ... but a girl (who has a birthday coming soon) can always hope! Terrific! I would love it just to hold a regular book. How fabulous! I love it. Thanks for the giveaway. I would love to win the book cover! Love the prints you used on this. Cute! Hello. It is gorgeous. I have a Kindle and I love it. I'm kindless, but sometime I hope to change that. Here's hoping! Very cute by the way...thanks! Hello, your bookeeper is gorgeous! I am a follower of your great blog too. Hi, I get inspired by the Moda Bake Shop all the time and love love love their fabrics! What a cute bookcase! I love the Moda bake shop. And what you've created. pick me, pick me. lets see if I get one! this would be perfect, but would love it even just for a note book to doodle and keep quilt ideas in. Really cute John! I love the decorative top stitching. I love your work. would love to have something you have made!!! Love it! I've been meaning to make something like that myself! That would be great with a moleskin to sketch in! Great giveaway! I love the fabrics you used! It's always a pleasure to visit your blog! It is always a pleasure to read your posts. I admire your creativity. Keep it up! Hello! Count me in on this one. I hadn't even heard of 'Kindle' until last night, and still haven't investigated to find out what it is! the colours are yummy. thanks for the chance to win. Thanks for the great give away! I have enjoyed seeing your creative blocks for your quilt block exchanges. Love the fabrics you used!! Hello! Just found your blog recently. Very neat! So pretty! I'm kindle-less, but would still love it! Beautiful work, as always, John! That turned out so great! Great giveaway! I am a grat fan of Moda Bake Shop too! Your work, as always, is fantastic! I've found so many fun projects at Moda Bake Shop, I love this little kindle holder =) Thank you for such a fun giveaway! Terrific giveaway item! And, when (ok, if) I win it will give me the best reason ever to go and buy a Kindle (which I really want). Cute giveaway, and your fabric choices are so "you." The colors and designs are upbeat and make this older gal smile. Thanks for the opportunity to get in the running for your gift. Great giveaway. It looks great. I love moda precuts and the moda bake shop patterns are great. Oh, I like that! I don't have a Kindle, but gave DD one for Christmas, so I'd probably send this on to her. Love your blog! I come here when I run out of inspiration. How can that be on a daily basis?? Book cover would work for me!!Thanks! First-time commenter here, but I'm from your neck of the woods-- grew up in Raleigh. I see that the quilt stores in the area must have gotten much better. This is a great giveaway-- I like to carry a Moleskine everywhere! Thank you for the giveaway, I love it. I love it. I hope I win. Thanks for sharing. oooh, I love it, I want it! Okay a creative man, who can sew, are you sure your wife truly apprecaites you? We're having a giveaway as well so make sure you stop by! That is so cute. I'm sure I could find plenty uses for it. Great prize John! Love all the stuff you can make with those pre-cuts. Thanks for the giveaway. love the fabrics you used on the cover. it would be fantastic for all the books i seem to be reading lately. if you get a chance, I'd love to hear where you buy your fabric-if you buy any of it locally. I am in wake forest just up the road! 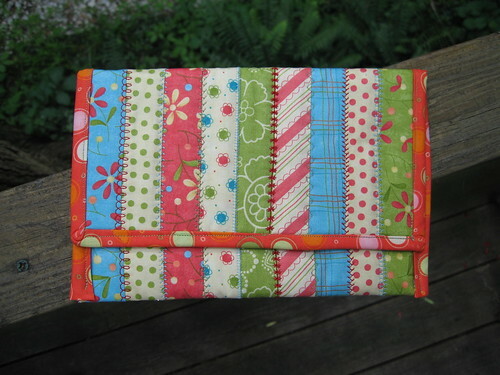 great gievaway-I don't have a kindle, but I love journal covers! I so want a kindle. I keep looking and wishing. Great cover. I wanna play. The bookkeeper looks great! No Kindle for me, but I see many many people using them these days. Nice job on your quilts. I always enjoy your blog. No kindle for me either, the library is still cheaper! I love the Moda Bake Shop and Objects of Desire is my favorite line right now! Okay- that is too cute. I love the bright colors... my fingers are crossed! I so have Kindle envy! Very cute bookkeeper! Love the decorative stitching! Thanks! Very cool I would give this to my mother for her kindle. Love it. Thank you for the giveaway. Hello, great job on the decorative stitching. My machine says that I can do that stitching as well but that would mean reading the manual:( and yes the Moda Bake shop is fun. Thanks for the chance to win! Hi John! I would love to see a recipe for a big, weekender bag on the Moda Bake Shop. I made Amandajean's tote bag and I got the "bag bug". I would love a big bag I can pack lots of things in for summer road trips. Great job on your giveaway! I love the decorative stitches! What a great giveaway! Thanks for the chance to enter! Your work is great! es una buena sorpresa encontrar a un papá que hace quilts!!! ayer encontré tu blog y me gustó mucho!! I love your moleskin cover, no kindle yet for me... thanks for a great giveaway! 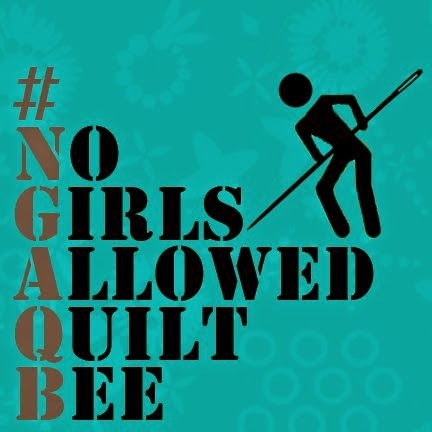 I have been following you for a while and am in love with your quilting...seriously...you are awesome...I would love to win something that you made! Love the colors you used! 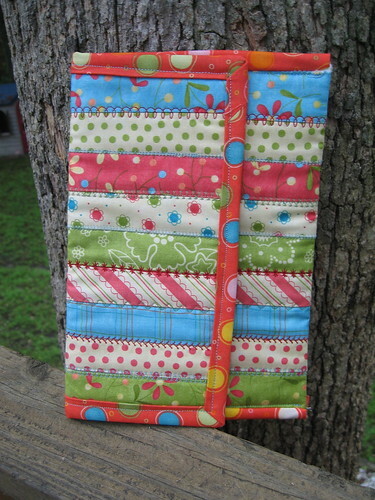 I would love to win this great homemade bookkeeper / Kindle holder - its fabulous! Once again a great posting. I get so inspired by your projects! Thanks for sharing them! Your work is so great. Thanks for an opportunity to have a little piece of it! That is so cute. I will tell my hubby he is not the only man that sews. Oh, my goodness I LOVE THIS! And, I have an addiction to moleskines! LOL! i'd love to win.... by the way your neptune doll quilt is priceless... i love it!! I think a sewing dad is about the coolest thing ever! Good for you. I LOVE THIS! Seriously, love it. I am Kindle-free but I would definitely use it. That is way too cute! I love your blog! you can never have too many!!! cooool - hope I win ! would love a kindle but you can't really beat a book all the same ! No kindle here either - but love the bookcover. So colorful! I so want a Kindle. Just another fan of Moda Bake Shop here. I'm always printing out destructions for one of their projects. Wow, I LOVE this! Thanks for the chance to win! Wow, that's awesome! Love it! Love to win! Lovely! Thanks for the great giveaway! Thanks for such a lovely and generous giveaway! That's so cute! I've been meaning to get my hands on some Objects of Desire for a jelly roll quilt I'm plainning. It's so Springy! Oh wow - I think I'll make myself one if I don't win! Fab! What a beautiful Kindle cover! Wish I had a Kindle. Maybe if I have a pretty cover, I can talk my husband in to getting me one? I have a Kindle! This would make such a pretty cover for it! John, always love your giveaways - here's to hoping I can win one of them someday! Love it! I would appreciate being entered in your drawing. Lovely bookkeper. The fabrics are lovely, which Moda line is that? Love your fresh doll quilt as well, I can't stop looking at that one. I'm kindle-less too, but I would still love to win this. I'm really into journaling so it would get a lot of use. Thanks for offering up such a great giveaway prize! great givewaway. Thanks so much. Wow. Nice job John. What a great idea. But, if you could throw in a Kindle too, I'd kind of like one-LOL! Great giveaway!! I have wanted to make one of those but haven't gotten around to it yet. Oh and I love love love your jewel of the seas quilt that you got. I need to make me one of those with the mermaid!! Sew cute! You do great work. I love it and I love Moda Bake Shop! The tutorials are for projects that wont break the bank and dont take a life time to make..ah well unless U R like me.. I love this and really want to get a kindle! WOW how cute is that. I don't have a kindle but sure would love one. Thanks for the chance. Cute book keeper. Love the colors! I am Kindle-less also have it on my wish list though!!! Very cool-- What a generous giveaway! i just recently started using moleskins and I absolutely love them!!!! what a great idea to make a cover for them!!! That is downright adorable. I love the different stitches you used. Super cute! Enter me please! That's great - so well made! Thanks for this great giveaway and love your site. I love your blog! This is such a cute giveaway - thanks for the tutorial as well - what a great way to use up scraps! Moleskeins are so awesome, I just filled up my first one - perfect time to get another! wow. i hope i win. that is soo cute. holy cow... i'll be post #140.. wow. No Kindle for me either, but that is a great journal cover! That's so cute! I just discovered the Moda Bake Shope this week while hunting for some scrap busting projects! Well I am glad I am not the only one who has no idea what a kindle is! I will have to go and google it now! Your bookcover is lovely - thanks for the chance to win it! Lovely item! Thanks for participating! It is beautiful. I have no Kindle either but I can think I many ways to use it. I love the Moda Bake Shop tutorials. what a great idea, quilt dad! i LOVE it! Look at you! Way to be crafty!! I just love the colors! Hi! I've been following your blog for ages, thought this would be a good time to delurk. You make some great stuff. Don't have a kindle, I'd have to put a paperback in it! hello again! i've been away but i'm glad to be back reading your blog! So cute! Love the color combos. Great giveaway - so here's my "hello." Hi John, I've been a fan of your blog since the past giveaway day when I discovered it. 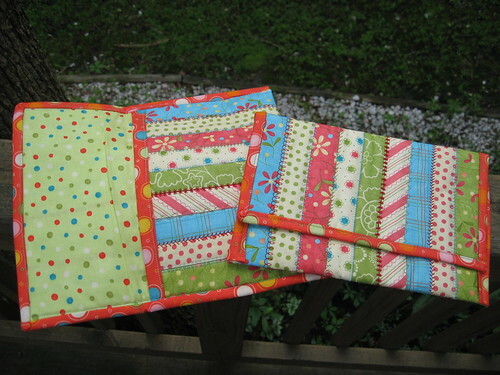 Thank you for sharing all of your projects, I follow all the lovely doll quilts that you make, they are AMAZING! I love Moda Bake Shop too! So cool! I don't have a kindle but I am in love with moleskins! nice job! fun to see a dad who quilts. count me in on your giveaway! No way. I would love to have that just to be able to tell people that a man made it. Awesome work. I am kindle-less but I write everything down (just so I won't forget) so it would be great for the notebook! I am Kindle-less too but would love to put a book in that holder! Thanks for the giveaway! Can I say what a huge fan I am of Moda Bakeshop! I want to try every single tute on there! Thanks for the cool prizes, hope I win! How handy is that! I love all the decorative stitching too! Thanks for the chance. What a great project and a good tip to visit the "bake shop" for more ideas! I love your prize, vey practical and very fun! P.S. I love Moda Bakeshop!! Oh, I'd love to win! I saw this tutorial on the MBS and thought it looked adorable - so fun to see your version of it! THis is a great giveaway...how fun it's been to go around to the different blogs! Thanks for participating. wow this is so adorable. Ilove your blog! Hello. Okay, now, I saw a tute for these... was it hard to make? It looks like it will be relatively easy but I would love an opinion. thanks! Awesome Giveaway & a great blog! I really enjoyed reading it a bit today!! I've peeked at your work before, and I really admire you. Figured this would be the perfect time to comment, since I usually don't. Love it! Thanks for a great blog and giveaway. This is adorable. I have the kindle app on my iphone - haven't used it yet! Wow, that's lovely! I really like the decorative stitching. That is very nice! I love the Moda Bake Shop! I love your idea, I will have to check out the Moda Bake Shop. I don't have a kindle either, but I bet my sketchbooks would fit in there! Follow your blog and your giveaway is just another example of your great work....count me in. Love this - great job! wow! i love the bright colors of your creations. great stuff. thanks for your generosity! Great giveaway!! I love the fabric! My parents used to live in Middlesex, NC. I'm familiar with that area. Ok. I think I'm missing something. What's a Kindle?